Every time there is a devastating event in our country, there seems to be two extremes among people. You have those who jump right in and give 110% to help; and then you have those who cannot fathom helping strangers. Thankfully, most of America seems to be somewhere in between these two extremes, which allows us to come together and help people in need nationwide, when they need it the most. The most recent natural disaster in the United States left thousands homeless in Oklahoma. Normally I would not get involved beyond praying, because we live paycheck to paycheck, and there never seems to be enough money for things around here. Then I realized something: waiting to have enough money/time to help those in need, is just like waiting to have enough money to have children; if you wait until you have enough you will never do it, because there never seems to be enough these days. You do what you can, and you have pride that you did something from the heart, simply to help someone in need. I’m really touched and thankful for all the messages of encouragement I’ve received the past few days. But truthfully, I am not anything but an AMERICAN that believes that in time of need we have to take care of each other. We have a badass military that will go all over the world to ensure our safety, but when disaster happens here, it’s the responsibility of every one of us to look after our AMERICAN brothers and sisters. Not everyone can get up and go, with no notice, to assist physically, but everybody can do SOMETHING. From donating a couple cases of water or food, throwing in $20 for gas, sending a mom some diapers, and DONATING BLOOD. It may seem like just a small contribution, but if everybody did the smallest thing, collectively we can make something really big happen for some people that lost absolutely everything. This is why we choose to help strangers, because it is simply the right thing to do; and it reminds us that every little bit of positive, loving energy we put out into the world helps perpetuate the change we want to see in the world. 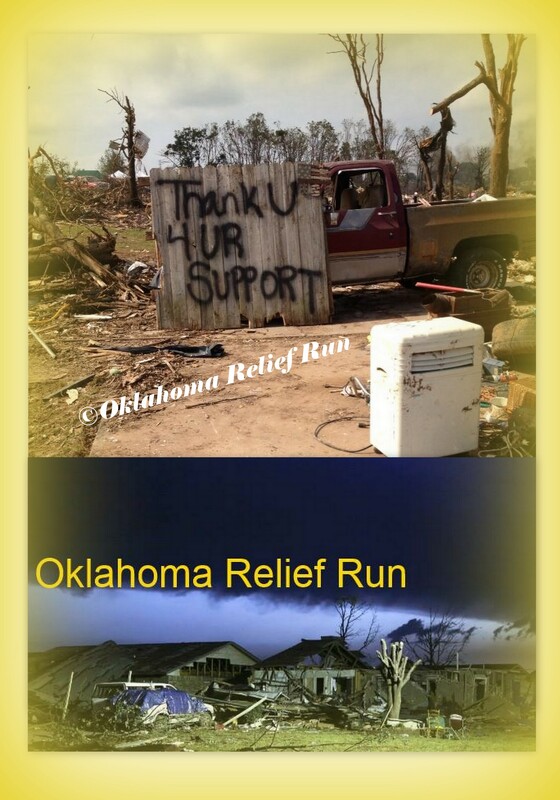 If you would like to help, please visit Oklahoma Relief Run on FaceBook, or you can make monetary donations on their site at GoGetFunding. To Autism With Love is doing what they do best, they are helping families in need. One of their admins lives very close to the devastation caused by storms and tornadoes in Moore, Oklahoma. She has committed to helping those effected by the storms and their path of destruction. As part of their Oklahoma Recovery Project, TAWL is requesting assistance to collect desperately needed items to aide families who are displaced by the storms. Normally, I am not one to volunteer or jump in to offer help, because our life is not conducive to such things. Every time I have attempted to organize or assist in something to benefit others, I have had to back out before completion, and end up feeling like I failed everyone. I vow to make this time different, and I will complete the task, because the families in Oklahoma deserve it! Fortunately, there is already an extraordinary group of people in Chicago, who go out and help those in need after natural disasters. They left for their first run to Moore today, but will be back to collect more donations before leaving again on June 10th to return to Oklahoma and deliver fresh supplies. They have agreed to take all that I can collect, on their next trip. The group here in Chicago, as well as TAWL and all their supporters, are truly Angels who walk among us. Please help them give the gift of love, support and hope to the many families living amongst devastation. If you are in the Chicagoland area, I am willing to pick up donations, and deliver them to this wonderful group, before they head out for their second run. I will need all donations by Friday June 7th, so that I can deliver them on Saturday June 8th. You can contact me at Jest_Tu_Positive@yahoo.com or via our FaceBook page. If you are not in the Chicagoland area, but would like to donate items or funds, please visit TAWL’s Website or FaceBook Page. Also, if you are a page admin and would like to get involved with TAWL’s efforts, please contact them at tawlawarenessproject@gmail.com. May God bless all those affected by the destruction in Oklahoma. May His Angels watch over and guide all the wonderful people who are willing to help these families rebuild their lives; and move forward surrounded by love, support and hope.